Not known to doing things the easy way, I entered a 50 mile ultra in 2009 as a goal to regain my fitness after the ankle break and I ran my first marathon in the build up towards this event. I trained hard (with my buddy Stouty), regained my fitness, practiced my running and managed to finish ….. nearly last! However, with a bit more training, practice, experience and miles in the legs I’ve improved a bit each year. Nearly 10 years after running my first ultra, you could say I’m an experienced long distance runner with around 70+ ultras under my belt including 20+ of 100 miles (or longer) distance along with a fair few marathons (30+) as well. I live in the South East of England so local marathon or ultra events in the area. I also am a fairly regular participant in the GUCR. Out of 70 ultras I’ve had one really good result (2017 Liverpool Leeds Joint Winner in 22.24 with fellow Spartathlete Paul Beechey), several ok ones (a couple of Spartathlon finishes amongst them), lots of average races, lots of below par ones and a handful of DNF’s. I was pleased to run my fastest marathon last year (finishing in 2.58). Probably the ones I didn’t finish which is generally down to entering too many races and not being sufficiently fit or motivated enough to finish them! The first DNF was probably the hardest (T184) when physically I could have easily walked it to the finish within the cut off but mentally I had quit. The year started well with a decent run at the Hillingdon 6 hour event and then I caught the dreaded man-flu and had an 8 week period of being ill, DNS’ing races, DNF’ing races and below par efforts at other races. Thankfully I’m now recovered and focussed on getting fit for the remainder of the year. My initial focus is another run at the GUCR which is one of my favourite races. I’ve completed it 6 times but never had a really decent showing at the race.. not sure why I keep going back. As preparation for this I’m running Crawley 6 hour (downgraded from the 24 hour event as I’m not fit enough for a 24 hour race yet), London Marathon and Ridgeway 40 (a non-competitive LDWA type event). After that my attention turns to Spartathlon and I’m not planning many (if any) events in the lead up and will focus on having a good ‘training’ build up. My better performances have usually come when I’ve started steadily and taken it very easy for the first part of the race and then gradually crept up through the ranks. If I can look after my feet, avoid the dreaded sleep deprivation phase at night and keep myself fuelled throughout the race then I usually do ok at races. I reduced my mileage a bit last year to an average of 75 mpw and tried to include a couple of effort runs which worked ok.
Generally, I will do 2 x 5 mile runs Mon to Thur, a longer run Friday, rest day Saturday and longer run Sunday. In the build up to a key race I might run a few extra miles and tend to use local races as good training effort runs. Treat each event as if it was the last time you were running it. I generally wear my lucky hat at races. After several years of use and good luck I unfortunately dropped it on the course during Spartathlon 2015 and thought it was lost forever. Rob Pinnington told me he found it (yay) but then couldn’t be bothered to carry my hat for the rest of the race and threw it away on the course (boo). 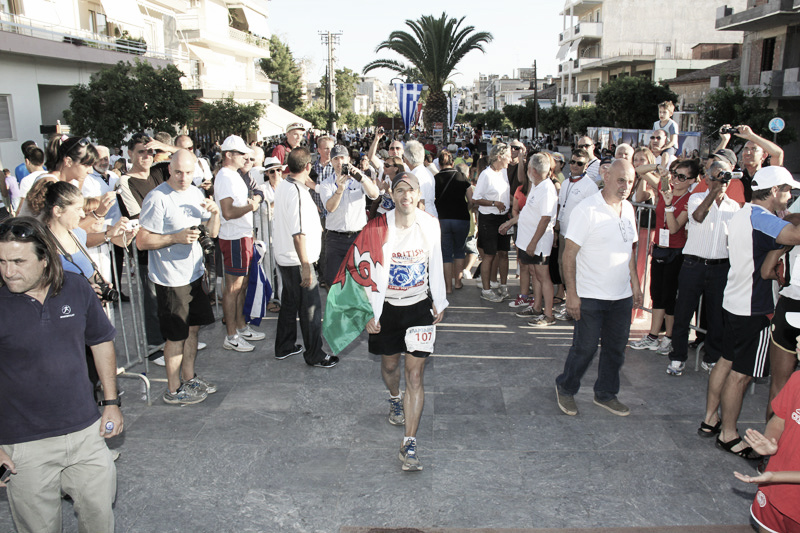 However, Mimi Anderson and crew actually found it on the course a day or so later whilst she was completing her Spartathlon double and kindly returned it to me. You can never keep a good hat down! Yes in 2013 and 2015. I finished in just over 35 hours and was honestly pleased just to finish having fast marched 75 miles with battered quads. I finishing in 32.5 hours in 2015 having looked after my legs a bit better although there was still a fair amount of marching so it’s a result that can be improved upon. Road miles as preparation. My quads were so sore in 2013 I couldn’t really run the second half of the race and I ended up marching a lot of it (with a huge positive split between the first second half of the race). My main highlights are of course the incredible emotional finish and seeing other runners and crews there all supporting and congratulating each other. I also enjoy getting to the top of the mountain (it’s really not that bad a climb) and looking back to view where you’ve just come from seeing the twinkling of head torches and knowing you’ve got a great chance of finishing the race. Finally, meeting up with like minded people and having a great weekend with other members of the British Spartathlon Team and all the crew/supporters. PS – Getting a record number of Welsh finishers this year with Nathan (2). That 30-50 mile stretch when you realise that you can’t stop at 26.2 today. Good consistent running for the next six months, getting my weight down so I’m lean and generally being ‘fit and well’. PS – My fellow Reading Jogger Ultra runners (Paul Beechey & Alex Whearity) would also say ‘cutting out the junk miles’. Yes, will hopefully be bringing a couple of friends (Keith & Adrian) to join other British crew members. Crewing is not really necessary for this race as they can only support you at specific Checkpoints but having lots of friendly faces around for the race (and days before and after) really helps add to the atmosphere and I’ve always enjoyed seeing other crews out during the race.